Jason Smerdon is coauthor of the newly revised Climate Change: The Science of Global Warming and Our Energy Future. 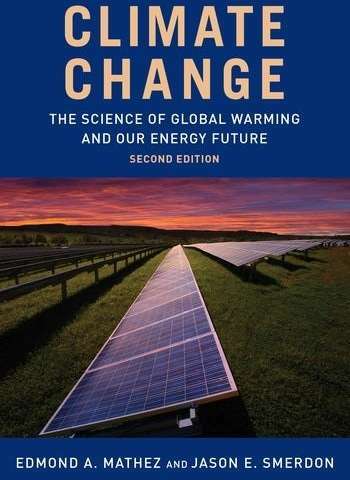 The book is a succinct, non-ideological reference for anyone who wants to understand what we know (and don't) about climate, from the basic workings of the atmosphere, oceans and solid earth through the long-term history of planetary climate, the human influence on it, and modern energy production and its implications. The book's first edition, published in 2009, was by Edmond Mathez of the American Museum of Natural History (Smerdon wrote the student companion to that edition). The new edition, with Smerdon as coauthor, is vastly expanded and updated. Smerdon is a climate scientist at Columbia University's Lamont-Doherty Earth Observatory and co-director of the Earth Institute's Undergraduate Program in Sustainable Development. We spoke with him by email about where climate, and climate science, are going. Have we learned anything truly new about climate in the last 10 years? The gross workings of the climate system have been well understood for a long time. But each year brings new discoveries and surprises. One of the most important pictures to recently come into focus is the degree to which the ice sheets in Greenland and Antarctica respond to climate change. Conventional thinking was once that they acted like big blobs that responded slowly to climate variations. It turns out that ice sheets really don't act like big blobs. Multiple mechanisms have been identified that suggest they may melt much more quickly than we thought. These include how water can infiltrate the base of ice sheets, how floating ice shelves can disintegrate quickly, and how warming ocean waters are destabilizing the West Antarctic ice sheet. There are also new studies on past sea level changes. Because the polar ice sheets were the principal cause of sea level variations over the past several million years, their fluctuating masses can be inferred from historical estimates of sea level changes. Such studies also support the idea that the ice sheets can melt much more quickly than we thought. Greenland and West Antarctica have multiple meters of sea level rise stored in their ice, so these findings are bright red warning signs. Another recent advance is our ability to assess the role that global warming is playing in current extreme events, such as droughts, heat waves and hurricanes. It used to be a refrain that no single event could be attributed to climate change. Now we can much more effectively quantify the probabilities of these events with and without human influence, and often can say humans have made an event significantly more likely or more extreme. This is based partly on improved physical measurements, and the accuracy and speed with which we can model climate. But it is also because the impacts of human-caused warming are now that much larger and easier to identify. It's an undeniable and sobering fact that human influences on the climate are impacting us now and getting worse. At this point, what are the best-understood aspects? What are the big unknowns? Let's start with the best understood: the earth is warming and we are causing it by dumping more than 9 gigatons of carbon into the atmosphere annually–a total of more than 555 gigatons since the start of the Industrial Revolution. Our book puts this into perspective by estimating that just 1 gigaton is about 11,364 times the weight of a Nimitz-class aircraft carrier. This has already caused a global warming of about 1 °C since 1880, and we are accelerating the dumping. We know this will in turn accelerate global warming and increase heat waves, fires, large hurricanes and other calamities. These associations are not scientifically controversial. They are well recognized as established cause and effect. What we don't know is the exact timing and nature of any surprises the climate system might contain for us–what we call tipping points. There are feedbacks in the system that can cause it to change rapidly and independently once certain levels of warming are exceeded. We have a pretty good understanding of processes that can cause feedbacks and how they have acted in the past. We have estimated that some tipping points may have already been passed and that others are lurking in a world not much warmer than today. It is nevertheless very difficult to estimate the exact amount of warming needed to reach a tipping point. We are therefore flying relatively blind in this regard. Why do so many Americans still scoff at climate science? I would challenge this generalization. An increasing majority of Americans correctly recognizes that humans are causing global warming and that we are already feeling its effects. But it is also true that many Americans view the findings of climate science through a partisan or ideological lens. For those who reject the scientific consensus, their views are based more on emotional reactions than rational responses. It is of course also true that some people who accept the consensus are doing so for reasons that are not exclusively rational. The big question is why our views have become tied to partisan and ideological predilections. I believe there are two major contributors. The first is money. Addressing climate change requires that we decarbonize our economy, and this threatens the bottom line of many powerful businesses. So there has long been a cynical and well-funded effort to sow doubt about the state of the science and to politicize the discussion. This is a disastrous development, given that climate change will affect all of us, regardless of political persuasions. Solving the climate crisis requires good ideas from across the political spectrum. Second is the fact that climate change is a slow and chronic threat. While many of its effects are now being felt, some of the most devastating impacts will not fully be manifest for decades. So it can be difficult to see this as an immediate threat, despite the fact that what we do now and over the next several decades will have huge consequences. This has worked together with the disinformation campaigns to give people the impression that delaying action is less reckless than it actually is. Can scientists increase their traction and credibility? Scientists already enjoy a significant degree of credibility with the general public. I would also posit that climate scientists have worked to engage the public more than almost any other discipline over the last several decades. These efforts have gone a long way toward educating the public, but there remains a sense that increased climate action will come through further changes in public opinion. Some argue that these changes should come through further public engagement by climate scientists, and improvements in how we communicate. Climate scientists can of course become better communicators. But because the discussion has become so political and polarizing, seeing this as a primary solution is like suggesting a similar approach for swaying public opinion on issues like abortion, gun control or evolution. I therefore don't see improved communication on climate change to be the panacea that some make it out to be. We also need to think critically about whether swinging public opinion is necessarily a winning strategy in our current political climate. After the Sandy Hook Elementary School shooting, a bipartisan bill would have beefed up background checks for gun purchases; public support for such measures is over 80%. But the bill failed, which many people chalked up to the influence of the National Rifle Association. There are even stronger lobbies aligned against action on climate change. The fact is that many of the structural issues straining our democracy are also limiting our ability to respond to climate change. Addressing problems like the erosion of voting rights, gerrymandering, weakened regulatory agencies, and the influence of money politics is perhaps also the most important means of making progress toward addressing the climate crisis. In the book, you say that climate change should be popularly understood as an issue of risk, not solely of science. What do you mean by that? This one is simple. We can say a lot scientifically about what will happen as the planet continues to warm, but the biggest uncertainties boil down to how we will act in the future. How will we generate energy? How will we use that energy? How many of us will there be? These and related questions have uncertain answers. Risk is a framework for how we deal with such uncertainties and allows us to think in terms of how climate is relevant to our lives, economy and politics. Understanding climate change through the lens of risk helps us devise sensible plans of action consistent with the range of possible future outcomes. In most cases, such thinking encourages us to act with great caution, given the massive impacts that are possible if we refuse to consider anything but a business-as-usual strategy for the future. it's extremely telling that they use the gun control analogy. they complain about partisanship but then analogize to another policy that is PURELY about politics and has ZERO to do with science ( unless you want to call 'social science' science , which it simply isn't. ) ----gun control is about values. if you believe humans shouldn't shoot each other , that's a SHOULD. that's a value. so they bring in a completely non-scientific situation to analogize to a policy pattern. i don't think that's a bad thing per se, it's just revealing. the reveal, is most people believe what they believe without much analysis. they base their beliefs on the loose footing of what they are told to believe by others on faith, regardless of the subject of the thinking. thus, many people are worried about political partisanship, but this is a false complaint in this context. if climate alarmists get others to agree with them for political reasons, it matters not to them. Whatcha gonna say when your doctor asks you if you have guns at home, and lectures you like they do about smoking?